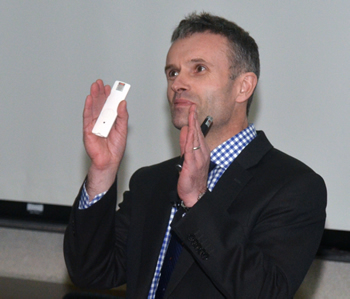 B. Duncan Lascelles, a professor of small animal surgery and pain management, was the Niemeyer Visiting Lecturer at the University of Missouri College of Veterinary Medicine on Feb. 13. 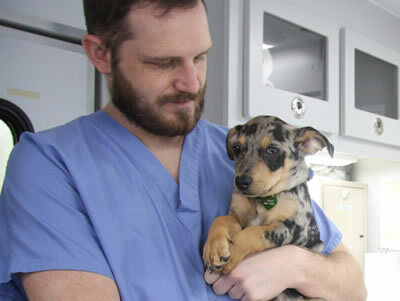 Lascelles’ research focuses on developing methods to measure pain associated with spontaneous disease in animals and understand the underlying neurobiology with the goal of improving pain control in companion animals and facilitating analgesic development in human medicine. 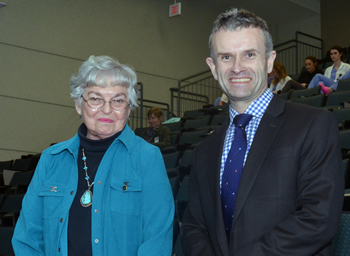 Margaret Niemeyer, who with her husband, Kenneth, established the Niemeyer Visiting Lecture Fund, meets B. Duncan Lascelles, who presented two lectures on Feb. 13. Kenneth and Margaret Niemeyer established the lecture fund to defray the expense of bringing experts to the college to deliver scientific lectures to veterinary students, faculty and other interested individuals. Kenneth Niemeyer was a 1955 graduate of the CVM and served on the faculty and as associate dean of academic and student affairs until his retirement. He passed away in 2011. 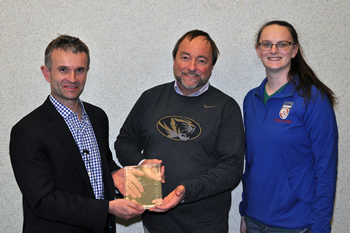 B. Duncan Lascelles receives a plaque in appreciation for his lectures at the CVM from Philip Johnson, professor of equine medicine, and second-year student Crystal Climer, president of the Student Chapter of the American Veterinary Medical Association at Mizzou.